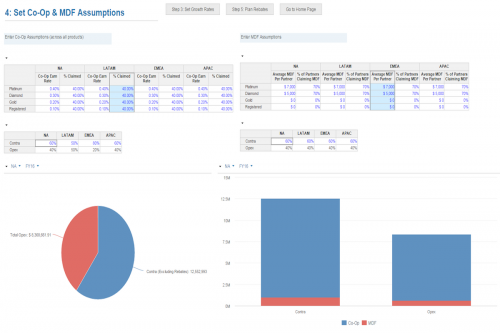 The ZS Channel Management Budgeting Tool allows you to dynamically set your channel program thresholds and evaluate your annual budgets based on your programmatic commitments to partners. Budgets are broken down by product category, region, and partner tier segments, and split out by operating expenses and contra revenue. Additionally, the tool incorporates performance management functionality to track the performance of partners relative to forecasts. Ultimately, this tool will provide a powerfully centralized view of your channel performance and budget and will enable a more effective channel planning process. 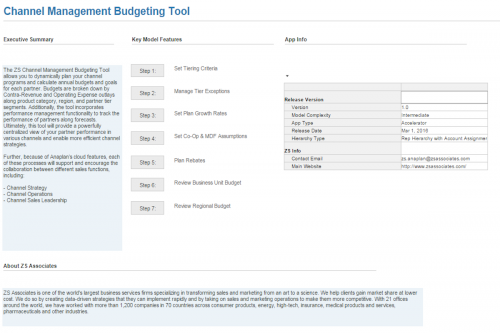 The Channel Management Budgeting Tool uses a tiering methodology based on a flexible combination of revenue, competencies, and service attach rates. You can alter these thresholds for the respective tiers (e.g. 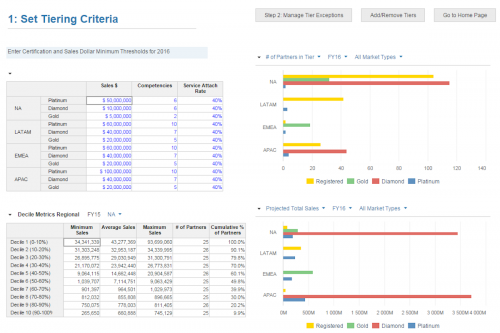 platinum, diamond, and gold) within each region and then view the impact of adjusting thresholds in dynamic charts that show the number of partners and total sales within each tier based on your set criteria. In addition to being able to programmatically assign partners to tiers based on the specified thresholds and historic performance, there may be unique cases where tiers should be manually adjusted. The tool enables a user to request tier overrides for partners and receive subsequent approval or rejection by the appropriate manager(s). 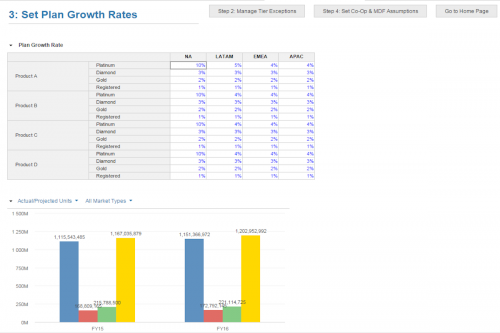 Planned growth rates are differentiated by product category, tier and region. Based on these inputs, you can visually compare current year projected sales to respective prior year actual sales by market type and region. Co-op earn rates and estimated MDF allocation per partner along with planned percent claim rates can be specified by tier and region; these assumptions apply across all products. Based on historic account and corporate policies, the split between contra and opex can be varied discretely by region for both co-op and MDF. This feature provides you with the flexibility to model out various rebate scenarios and allows you to evaluate the projected cost given the planned growth of your channel. The app enables you to vary rebate rates and thresholds relative to targets based on partner tier, product category and region. You can then alter the target attainment assumptions for their partners allowing you to project rebate exposure for each region and product category. 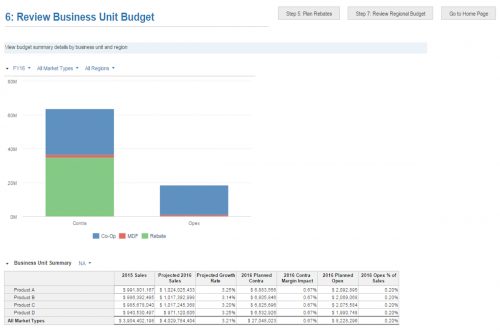 After all the planning assumptions have been entered into the app, you can review the budget summary from either a business unit or regional perspective and evaluate the culminating impact of your planning assumption on output metrics such as projected sales, operating expenses, and contra revenue. This visibility enables you to make data driven decisions while planning channel partner program budgets for forthcoming years.